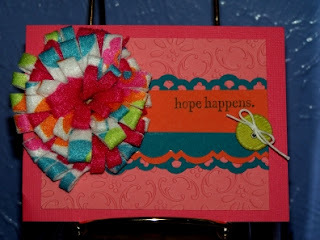 This week at Twisted Sketches I played with a rolled felt flower. The felt is cut 1 inch by 1 foot. then folded in half lenghtwise and stitched along the selvages. Then I snipped along at 1/4 inch intervals. The I simply rolled my felt around and glued it to a piece of cardstock using Crystal Effects. Make a pretty rosette. If you'd like to play along with us at Twisted Sketches please pop on over to their blog and follow the sketch and the "TWIST" to create your card. Don't forget to check out the rest of the DT and leave them some love, they'd REALLY appreciate it!